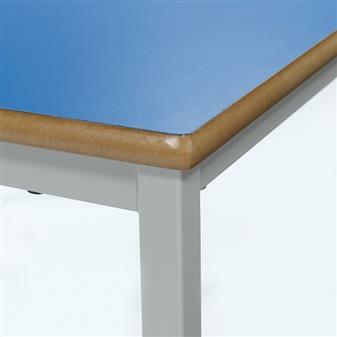 Robust trapezoid nursery classroom table with an MDF laminated top, which comes in choice of 10 laminate top finishes. 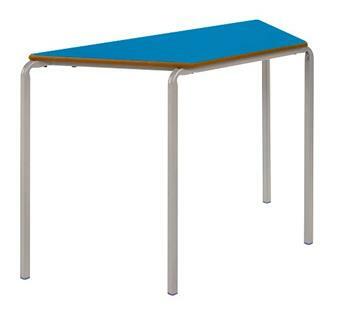 This furniture is ideal for the nursery school, pre-school, play school, early years classroom, primary school, and other childrens educational environments. Two tables can be pushed together to form a 6-sided table or other rectangular tables can be pushed in between to make a larger overall table. The table is available in 3 heights and can come with a rounded bullnosed MDF edge. Minimum Order of 6 call the office for small order charges below this quantity.